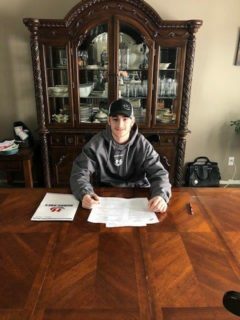 Lethbridge, AB – The Lethbridge Hurricanes Hockey Club have signed 2002-born defenseman Dylan Ashe to a Western Hockey League Standard Agreement. Ashe, 16, was undrafted in the WHL Bantam Draft. The product of Warman, Saskatchewan registered eight points (1g-7a) along with 34 penalty minutes in 31 regular season games in 2018-2019 with the Tisdale Trojans of the Saskatchewan Midget Hockey League. Ashe appeared in seven post-season games this year with the Trojans. The 6’1, 185-pound, right-hand shot defenseman has appeared in 45 career games with the Trojans over parts of two seasons collecting a total of 10 points (2g-8a) along with 44 penalty minutes. During the 2018-2019 season, he dressed in one game with the Melfort Mustangs of the Saskatchewan Junior-A Hockey League. Ashe, along with the Trojans, will attend the Midget National Championship known as the Telus Cup from April 22-28 in Thunder Bay, Ontario.